Do you want to know how I know that the Earth is a perfectly balanced sphere and not flat? 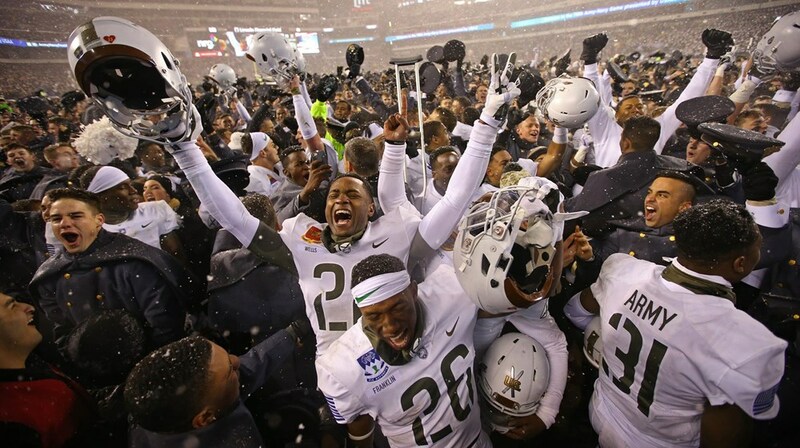 Because the Army Team just beat Navy for the second straight year! The proper order has been restored and the streak has begun. Plus, Buzz Aldrin said it is and you know he can’t lie, cheat, or steal. 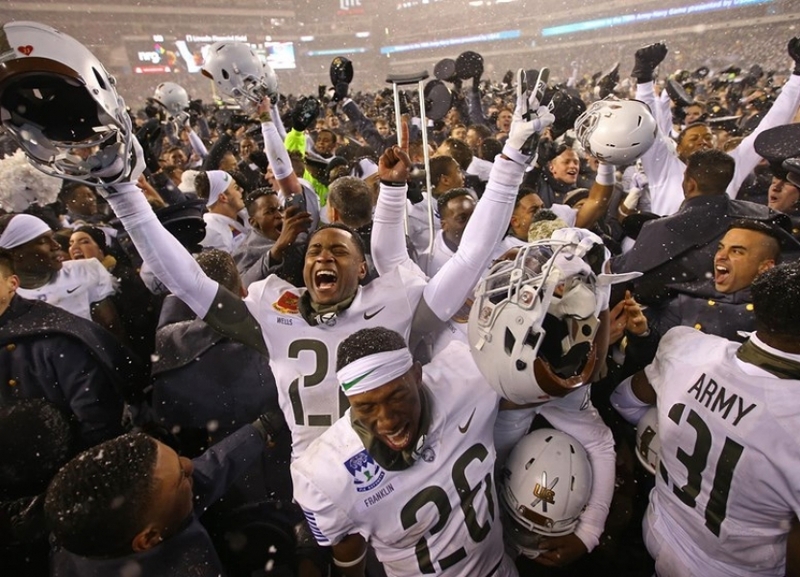 Army claims the Commander-in-Chief’s Trophy for the first time in 21 years. The Cadets also won at Lincoln Financial Field for the first time in 11 attempts. Do you realize that the Black Knights are 12-3 in their last 15 games, with losses to Ohio State, Tulane, and North Texas? In 2015, the boys lost seven games by less than a touchdown. We have now won seven of our last nine games that were decided by less than seven points. Winning is the standard and the expectation. My Garrison Cap goes off to Boo Corrigan, General Caslen, and Saint Monken for investing in the change. 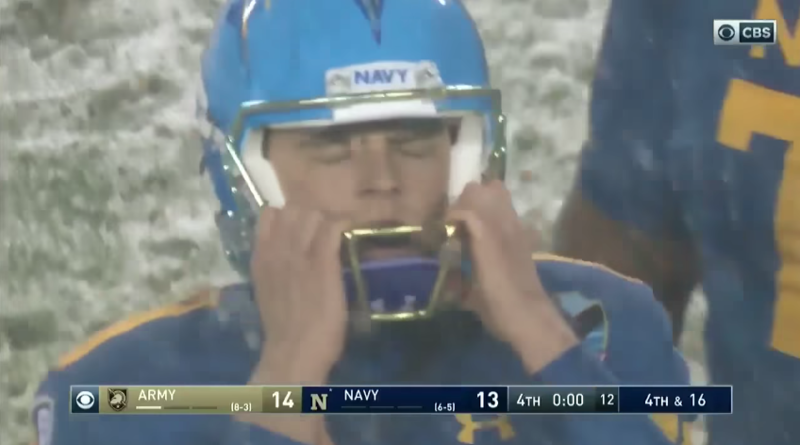 USMA old grads thought we might just steamroll Navy completely after the first drive that chewed almost seven minutes off the clock ended with a touchdown. Darnell Woolfolk barrelled through the Navy defenders in the Red Zone like a hot cart in the mess hall making it’s way to a Corps Squad table. Then we saw the new squid quarterback (where did he come from) rip off a 68-yard touchdown run and bad memories of Keenan Reynolds started to fill our minds. Although statistically, Navy looked better, they couldn’t finish drives. 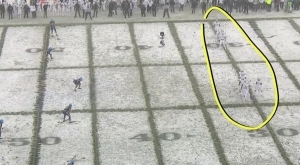 They had more total yards and yards per attempt than Army, but only went 2-11 on 3rd down. They just don’t possess that killer instinct that the Army has developed from fighting and winning America’s Wars. The rest of the storylines from the game are covered in the superlatives below. I know that you don’t want to take it. Since we know you can pass it, we’ll just have your TAC NCO give you a 276. We saw you run down Malcolm Perry like you were sprinting past the finish line at the two-mile course to the trash can. Although it won’t show up on a stat sheet, that relentless effort won us the game. Your future Company Commander will be delighted by your can-do attitude when fourth quarter SHARP training comes up. I’ve never gotten one, but Texans always do it big and I bet their snack filled care packages are no exception. After managing to stay on your feet during the eight-yard scamper to the half yard line, you deserve it. I don’t know what you got on your IOCT, but if you don’t have a tab for your PT shorts, I would be surprised. If Mr. Dotson is still working in the mail room then we’ll make sure you don’t have to wait in line for the package either. You shouldn’t need anything else. You have the best job and we are all jealous of you. Apparently, the other ones that Coach Ken had the team of specialists from Walter Reed National Military Medical Center design for you didn’t work. Although you won’t play football here at Army, as an exchange cadet you will be in for some perks like extended PMI and Grant Hall vouchers for your performance this year. Back-to-back penalties by you two added 10 extra yards to Bennett’s potential game-winning field attempt. Guess you midshipman took a page out of Mike Nemeth’s best selling Naval Academy Discipline book. Don’t worry, we’ll send you a copy just in case. Remember, 95% of the globe is still covered by water, so you can still succeed somewhere. We are not interested in seeing you suit up for the squids again. Let’s be honest, we all know that Navy was probably your only offer. Heck, you probably didn’t even know Navy had a football team until Ken came to your school. I can see you now saying “Coach, what’s USNA?” I went ahead and sent some game film to several MAC and Conference USA Schools. 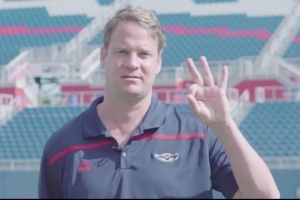 Lane Kiffin should be sliding into your DM’s soon. All jokes and rivalries aside, we are thinking of you and your family. So I decided to do this because 1) I Love College Football and 2) I especially Love the Army Team. I’m unsure of how much traction this satirical Bugle Notes Blog could get, but if you liked this article then share it, post it, or send me an email. I would love to write a Bowl Game Preview for the Armed Forces Bowl and give out superlatives after.